The long-running series rotates creators with almost every story arc. 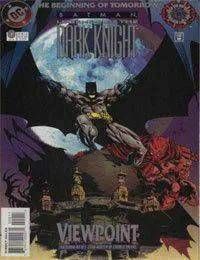 Though tales focus on Batman, they can be told at any point in the timeline -- even in the future. Originally conceived as a vehicle for any and all Batman tales, no matter how far-fetch. Legends has been slightly more conservative. Though stories are generally separate from current continuity, Legends has touched the main Batman titles significantly, particularly with the introduction of Venom, the drug that gave Bane his incredible strength.